Milo Yiannopoulos' 'Free Speech Week' At Berkeley Falls Apart, Organizers Say The right-wing activist and a student group organized the event as a response to what they see as university efforts to shut down conservative speakers on campus. The event was meant to start Sunday. After days of uncertainty, an event at the University of California, Berkeley, touted as "Free Speech Week" by organizers — including far-right activist Milo Yiannopoulos — has been canceled. "Free Speech Week," a four-day, right-wing rally at the University of California, Berkeley, has been called off, student organizers of the event tell member station KQED. Another organizer, controversial far-right activist Milo Yiannopoulos, will reportedly hold a press conference on Saturday formally canceling the event, which was scheduled to start Sunday. A spokesperson for Yiannopoulos told KQED on Friday that he "couldn't confirm" the event would happen. The event fell apart after the co-organizers — The Berkeley Patriot, an online publication, and Yiannopoulos — failed to confirm the guest list and book multiple indoor venues on campus. Tensions and confusion mounted this week ahead of the event, which organizers said was planned in response to Berkeley's efforts to shut down conservative speakers. 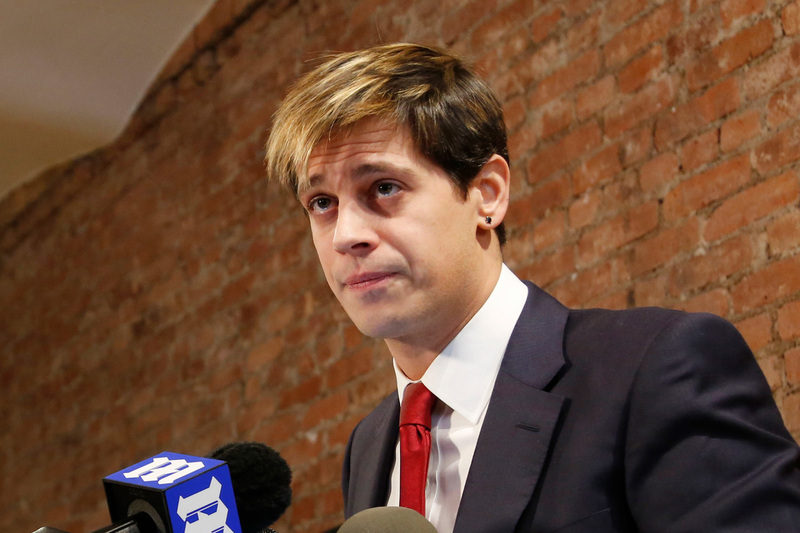 A fierce debate about free speech on campus ignited in February when the university canceled an appearance by former Breitbart editor Yiannopoulos because of security concerns. Steve Bannon, former adviser to President Trump, and conservative commentator Ann Coulter were reportedly scheduled to speak at this weekend's event, but their appearances were never confirmed. Coulter had also been scheduled to appear at Berkeley in April, but her speech was abruptly canceled and protests followed. The confusion around whether Bannon and Coulter would appear is "part of the whole chaos" in the runup to the Berkeley event, said John Sepulvado, host of KQED's The California Report. "It is part of the M.O. of these activities ... to be as confusing and disorienting as possible," Sepulvado told Here & Now's Jeremy Hobson earlier this week. Since Yiannopoulos' appearance was canceled earlier this year, students and right-wing groups have criticized Berkeley — widely considered to be one of the centers of the free speech movement in the 1960s — for shutting down conservative speech. Berkeley officials say the school is committed to preserving free speech but at the same time must protect safety on campus. Yiannopoulos posted a YouTube video this week saying the university is using "slippery and bureaucratic tactics" to try to prevent the event from happening. The university did not try to cancel the event outright, as Yiannopoulos suggests, but a group of about 130 professors, graduate students and lecturers called for a boycott of classes and university events next week. An open letter argued that many students, faculty and staff would feel unsafe at school because of the anti-immigrant, anti-female, anti-gay rhetoric of many of the speakers. They also expressed fears that there might be an "uncontrollable confrontation" during the week. What about the legality of such rhetoric? Hate speech is protected under the First Amendment, in part because there isn't a legal definition of it, says Santa Clara University law professor Margaret Russell. A person can only be prosecuted for a specific crime associated with the hate speech but not the speech on its own, she explains. "I think the law is pretty clear, at least to the extent that hate speech is not considered, by itself, to be unprotected under the First Amendment," Russell told Hobson in February. "So, if people want to enact laws or if people want to prosecute people who violate the law, the prosecution can't be based on the viewpoint of the person. It has to be based on the underlying crime." The free speech debate has grown more contentious in light of the growing number of nationwide protests since Trump took office. In August, a woman was killed after a group of white supremacists and neo-Nazis at a "Unite the Right" rally violently clashed with counterprotesters in Charlottesville, Va.
Sepulvado of KQED says it's no coincidence the far-right is using Berkeley — one of the most liberal cities in the U.S. — as the center of this debate. "It's become a center of far-right speech because the far-right has taken the tactic — and Milo Yiannopoulos being the prime example — of essentially trolling people who wouldn't want to hear it — and that's what this is," Sepulvado said. "When I talked to Berkeley Patriot, and I said, you know, 'What is the academic value of having Ann Coulter or Milo Yiannopoulos speak on campus?' They say there isn't any. They are the first to acknowledge that there is no academic value." Since NPR published this story, it's come to our attention that significant questions have been raised about the methodology of a survey quoted in this report. We've removed references to the survey, which was conducted by a nonresident senior fellow at the Brookings Institution. You can read more about the questions surrounding the survey here.